For the past 85 years, my family has been handing down the skeletal remains of someone we call Felix. While this may sound sinister or downright peculiar, let me assure you that Felix holds a cherished position in our family. He’s a silent but reliable teacher and a master at imparting lessons of impermanence — someone who is just plain good to have hanging around. Felix — affectionately named by my grandfather, George Becker Sr. — was born around 1900 and was about 17 years old when he died. His cause of death is unknown, though my grandmother always maintained he had been struck by a Model T Ford. Just how did we come to possess the remains of Felix? My grandfather was a young boy when his father was thrown from a horse-drawn wagon after a practical joker startled the horse. He suffered a traumatic head injury that kept him from meaningful employment for the rest of his life. Coming from a family in which industriousness was the paramount virtue, my grandfather studied hard and eventually borrowed money and played semi-pro football in order to attend Hahnemann Medical College in Philadelphia. 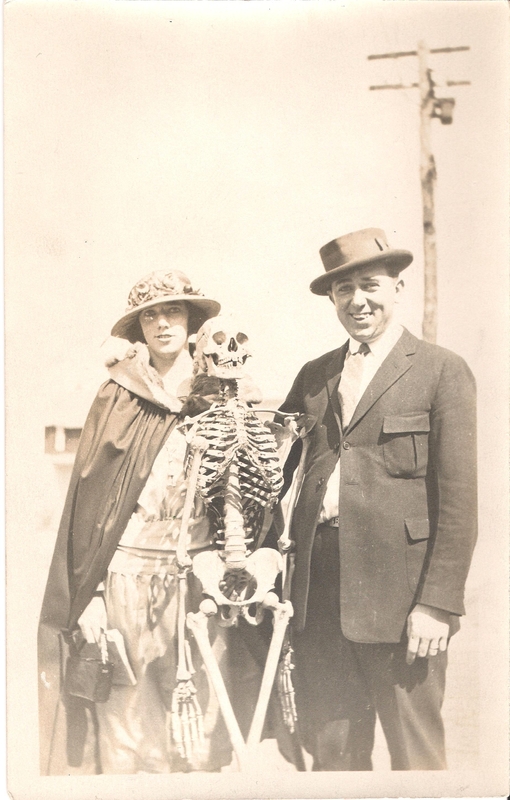 Around 1925 in a gross anatomy seminar, he and his classmates were issued human skeletons to use as study aides. Felix’s body had already been tidied up by the time my grandfather received him. Sinew had been stripped from the bone; his skull had been horizontally sawed so that the skull cap could be removed; his jawbone was fitted with a spring to keep it from falling off; and a nice clean hole was drilled into the top of his head so that his wired frame could be hung from a rack. What’s not so nice to observe about Felix’s skeleton are the small Greek letters of Pi Upsilon Rho — one of the oldest national medical fraternities — painted on the front of his skull cap, and a few small dark smudge marks on the inside of the skull that very well may have meant that Felix’s head was once used as an ashtray. Don’t be too quick to judge, friends who are doctors tell me. In today’s era in which medical schools hold tasteful ceremonies where students recite poetry and offer flowers to the memories of the cadavers they dissect, using a human skull to extinguish cigarettes is inexcusably offensive. But as anyone who’s seen “M*A*S*H” knows, the stress associated with first and intimate encounters with human remains takes its toll and often comes out in the form of gallows humor. Imagine what it must have been like in the emotionally sterile medical schools of the early 1900s. In 1954 my father became the second George in our family to graduate from medical school. With the department of surgery award for highest grades in hand, he chose to add six years to his training to become a neurosurgeon. Felix came faithfully along, once again lending his body as a teaching aide. Right up until his retirement, my father kept Felix’s skull on his desk and rehearsed complicated brain surgeries before entering the operating room. While the top of the skull resembles a smooth tortoise shell, the lower section is a landscape of ridges and valleys. An empty cranium, without the presence of a pulsing human brain, is an invaluable three-dimensional tool, he told me. As a child I would sometimes sit in my father’s swiveling desk chair, putting my fingers into Felix’s eye sockets and wiggling his few remaining teeth. I’d wonder for hours what he had been like while he was alive. Did he have brothers and sisters? How sad they must have been when he died, I imagined. Because it didn’t have the guts. I’ll have two beers and a mop. In the dim light of our hallway that night Felix seemed to smile ever so slightly, as if he were enjoying the festivities, too. While it was my brother (yes, another George) who became the next in our family to graduate from medical school and to offer his home as a resting place for Felix, I — who dropped out of pre-med classes my first week of college — came to appreciate the skeleton in a different way. I chose to study social sciences and ended up working in human rights, where skeletons are assessed for evidence of torture and genocide. In my travels throughout Asia I became attracted to Buddhism, with its emphasis on impermanence and nonattachment. Depictions of ancient charnel grounds in the sacred art of India and Tibet — with bones scattered about and vultures pecking at decomposing bodies — just never seemed that frightening to me, probably because Felix made our home a graveyard of sorts for decades. What becomes of Felix next is not clear to us. With each passing year, his bones turn more brittle. His paper-thin temples are cracking; the tips of his fingers shed off bits of grainy dust. Even the rusting wires that hold his bones together look like they could snap with age. Today you can order a standard anatomical skeleton made of unbreakable plastic for $250 online, free shipping included. One company even names its skeletons — Leo, Max, Bucky. Should we somehow dispose of Felix and trade him in for the newest model to pass down to the fourth generation? I’m afraid we’re just too attached to Felix — his physicality and the family lore that’s developed around him. In a sense, he outlives us all. Get rid of Felix? Maybe we simply don’t have the guts. Nice! Congrats on getting this published on Salon, it’s a great story. I don’t have a strong opinion on whether to keep Felix or not, I think if ever there should come a good time to give him a rest, you guys will know it. Just listen to your gut feeling on it. You never cease to amaze me. Wonderful story. Attachment of the sentimental kind is a very human trait. I vote for keeping Felix around for generations to come.